What Customers Want to See on Their Phones? It’s not new. But mobile phones are quickly taking over. Today’s cellular devices are more powerful than many desktop computers. Businesses today can no longer afford to brush mobile aside. Not investing in a mobile website design is no longer an option. Your customers may be millennials. Or they may be genXers. They’re both using their phones more than ever before. Seniors — they’re going mobile too. Mobile is the battlefield on which today’s businesses contend. If you’re not on it, you’re sitting on the sidelines. But what does mobile-friendly really mean? If you don’t know what people want to see on their phones how can you deliver the right experience? You can’t. But this article can change all that. Let’s look at what people really want. 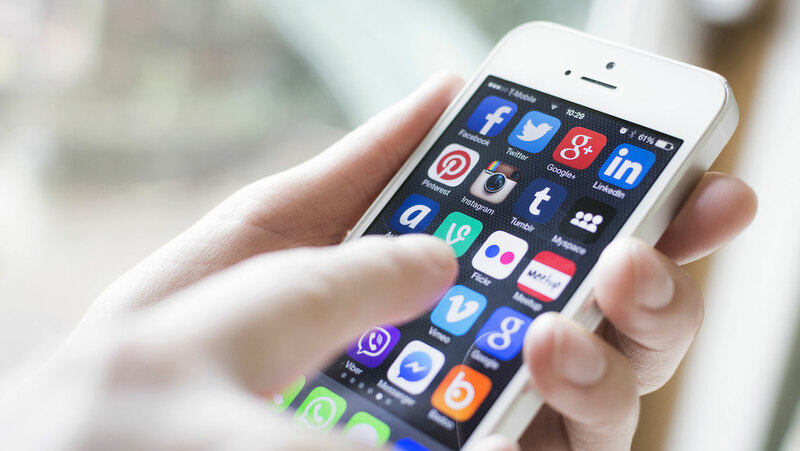 Chances are you’re no longer on the fence about mobile. But it’s important to remind ourselves why investing in a mobile website design matters. It will help us understand how to focus our efforts to create the best customer experience. 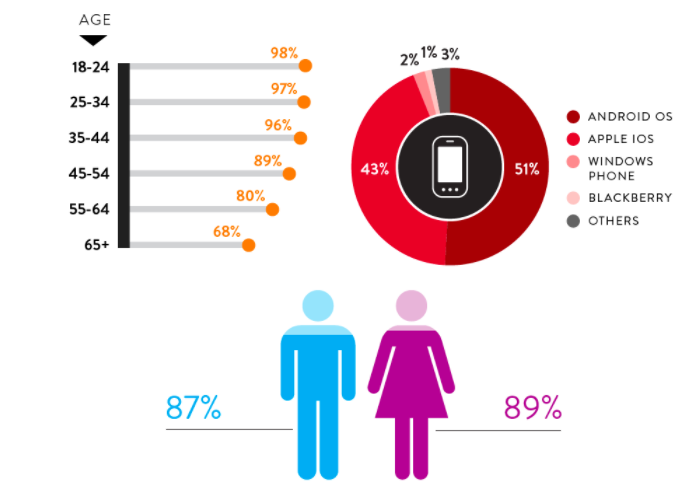 Neilsen Group found that 97% of 18 to 44-year-olds own a smartphone. Among the 65+ crowd, you might expect this to drop off. But a staggering 68% own them. This is almost everyone. Only slight gaps exist among gender, race, and income. For 50% of people in the US, the smartphone is the first thing they reach for upon waking. Mobile traffic now accounts for over half the traffic to a site with a mobile website design. This is traffic that would otherwise go to their competitors. According to a Google study, 57% of mobile users would refuse to recommend a business that doesn’t have a responsive mobile website design. They also found that 61% of people won’t return to a site that has a poor mobile experience. 40% will immediately go to a competitor site instead. Ouch! Consumers redeem mobile offers at a rate of 10 times that of print offers. It’s just about access. Businesses who make saving money and time easy win big with customers. They use apps like Yowsa to find coupons in their geographic area. They turn to Coupon Shepherd and Cellfire to find coupons for big brands, big-box stores and more. Conversion rates on mobile devices are 64% higher than desktops. Are you a local business? You’ll love this one. According to Google, 76% of people search for local businesses on mobile devices. 76% of people who visit a local website, will visit that business within 24 hours. Can you deduce who they visit if you didn’t show them what they want on their phone? Cater to your local customer through effective mobile website design. Get more actual local customers through the door. Around 30% of eCommerce purchases are through mobile devices. Plus 66% of eComm time is now on mobile. That means that people are browsing on their phones a lot more than traditional computers. We see nearly 9% of tablet visitors adding something to their carts. If you’re in eComm, you know that’s huge. If you convert a fraction of that, sales could skyrocket. Mobile website design is how it’s done. Nearly 70% of searches in the US are done through this search engine. Over 50% of Google’s queries are coming in through mobile devices. Because of this, Google has led the charge to make the Internet a more mobile-friendly place. In mid-2015, “Mobilegeddon” began. It continues today. As the gatekeeper website traffic, they have the power. They can reward sites that have responsive mobile website design with higher rankings in searches. They can also penalize sites that don’t provide a strong mobile website design experience. As Google continues to raise the bar, websites that don’t mobile-optimize disappear from search results. Mobile optimization is more than just making a site fast on mobile. It’s more than making sure text and buttons are finger-friendly. It’s about designing a mobile website that demonstrates a clear understanding of how the mobile user interacts with the site and your business. Let’s look at how you can create a mobile website design that gives people what they want on their phones. Start here. Gather and analyze data to better understand how your target customers interact with you and your industry. Are they watching videos? Are they looking for pricing? Are they ready to buy? Are they looking for your contact info? Are they in store checking product details on their phone? Consider the ways a customer uses your site and make that journey as seamless as possible. This can vary a bit among eComm, local, and those servicing a national clientele. While there are some clear best practices, you must first know your customers. We’ll discuss using analytics to figure out what your customers want a little later. In late 2016, Google released an update to its algorithm. Cleverly nicknamed “possum”, this update gave preferential treatment to local businesses. People who are searching for local services online are high intention. That means that they’ve already done the research. Most often, they’re ready to act right now. Make it super easy for high intention users to act quickly in one to two clicks. When you recognize how high intention these visitors are, you will build your mobile website design around that last step in the buyer’s journey — whatever this may be. If coupons are hard to find or they have to leave the site to get directions, you don’t have a mobile optimized site. Local customers want a mobile website design that clearly demonstrates that the website is local. Any confusion over this will cause a bounce. Next, we’ll look at how to show both customers and search engines you’re local. This may seem obvious. But because websites may be hosted elsewhere, sometimes it’s not clear who the local sites are. If you’re local, you need to do everything you can to ensure that search engines know that your site not only has a mobile website design. It’s also a local site. To do this, make sure your physical location is in multiple strategic placements on your website both in the code and on the page. This should be at minimum your city and state. Here’s are places that you can put your location. Content — blogs, video titles, etc. It may or may not make sense to use all of them. Don’t allow your site to seem spammy by over-stating its location. But do be clear by putting information in several places. Local customers want to easily find local business. Optimizing for local searches (Local SEO) in your mobile website design is optimizing for customers as well. On mobile, you simply have less room to work with. Fewer characters may display. Create concise and impactful titles. Don’t just default to your desktop title. You can specify what title to use on mobile devices. People watch videos on mobile. They read blogs. They interact with widgets and apps. They do everything on mobile they do on desktops. Customers don’t want to have to scroll or load new pages unnecessarily. Make sure your content is designed for maximum impact on mobile devices. You’ve no doubts about the importance of the CTA. But what should a CTA look like on a mobile website design? Let’s again turn to what the customers want. 70% of consumers say that the call button is the most important element in mobile website design. They want something very clear to click on when they’re on a mobile device. This takes them to the next step. CTA’s aren’t the time to get wordy or creative. Language should be straightforward, leaving no question what you want this person to do. This not only gives the customer what they want. Clear CTA buttons reduce your bounce rate. This is when a person leaves your site without doing anything on it. Reducing your bounce rate is good for SEO and the health of your website. It, in turn, increases conversions. If more people click on a call to action button, more people take the desired action. 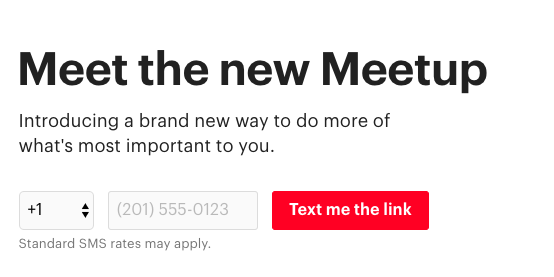 Take a look at this clear CTA on Meetup’s Website! There’s no question about what the page wants you to do. Over 1/2 of mobile users will abandon a website if it doesn’t load in fewer than 3 seconds. 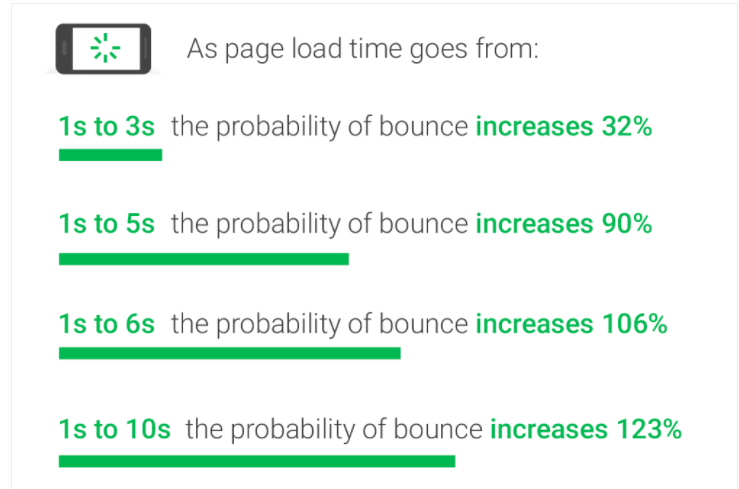 And yet Google research shows that the average landing page takes 7 or more seconds to load. This not only demonstrates a disconnect between businesses and what people want. It’s a competitive advantage for those who keep their site under a 3 second load time. Check out this data from Google. This data shows that if the site doesn’t load fast, visitors immediately assume it’s not designed for mobile. They leave. Optimize images — Never add an image that is larger than its display. Free image programs that come standard on Mac and PC will allow you to change the dimensions so that it matches your site. Minify code — Programming can create a lot of redundancy. Eliminate this to reduce how much code must be read to render your website. Reduce Redirects — Redirects can be user-friendly. But they can also be overdone. If a link is redirecting through one or more URLs, fix it. Analyze when making changes — If you add a video or make a major change your site, test it on mobile devices to ensure that speed was not compromised. Conversion rates on websites decrease when there are more elements on the page. Elements include each image, button, title, word, video, link, widget, lightbox, etc. It includes everything in your header and footer, including every menu button. Once you start counting, you’ll find there are many more than you think. Once the number of elements on a page nears 6000, the bounce rate reaches around 95%. It steadily climbs up to that point. We’re not suggesting that you go and try to get an accurate count of the number of elements on your page. But know that keeping it streamlined reduces that bounce and gives people what they want. If you have long-form content like this blog, it’s important to apply strategies to reduce your bounce rate while providing an amazing customer experience. Putting links to your other content early in the blog can help you in this regard. eConsultancy found that a massive 30% of people will opt to use a search box rather than your menu to find what they’re looking for. Mobile users are often on the go. If they can shave 2 seconds off their search by having it done for them, they will. On top of this, after a person has used a search to find what they’re looking for, they’re 6X more likely to convert. And, as if this weren’t enough, it lowers your bounce rate. Remember, a low bounce rate is good for SEO. Give your mobile consumers what they want with a mobile website design that includes an effective search function. In early 2017, Google acknowledged that it had released an update to penalize websites that pop obstructing things up over the screen, hide the close button or otherwise interfere with mobile user experience. This update didn’t get a clever nickname. It’s simply called the “Mobile Intrusive Interstitials” Penalty. These popups may be harmless, welcoming someone to your website or asking them if they want a free eBook. But people don’t want them. We can clearly see from the stats in the first section people are using their phones as an augmented reality with brick-and-mortar businesses. Your mobile website design should feel like an extension of your business, not something else entirely. In eComm, this same integration applies. The easier we make it for people buy in just a click or two, the higher conversion rates. Gartner Research Group predicts that personalization with increase eComm conversion by 15% by 2020. We’re already seeing this in action. 58% of people surveyed by SalesForce said personalization is very important. 62% like to see offers that are based upon their buying behaviors. 52% are willing to share more data with you if you can provide a more personalized experience. These findings are strongly supported by hard data reported by CMO. It showed that retargeting can increase click-through rates by 400%. Also called “remarketing”, these are those ads that know what websites you’ve visited. As it turns out, most people like these kinds of ads. They want to see them on their phones. But remember to always balance ad space with content space. They don’t want pages full of ads. You can’t provide a mobile website design that people want without analytics. It’s important that you’re tracking how your mobile website design is performing as well as ensuring that you’re putting your efforts toward things that people actually find useful. See what’s out there in your industry. How are other companies giving people what they want to see on their phones? Go beyond your own industry. Look at apps and options that others use to create a more integrated and personalized experience. Never copy. Do it better instead. Listen to your customers. Make note of common challenges addressed by customer service. Ask customers directly what would make your mobile website design more appealing to them. You can get a lot of insight out of Google Analytics, a free tool. 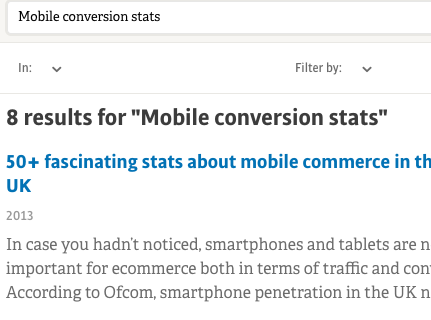 Know what percentage of your traffic is mobile. Identify which sites are referring traffic to your site. You can work with those sites to create a more integrated experience. If you’re getting significant traffic through Facebook, for example, you’ll focus on building a bridge between this site and your mobile website design. Find out which pages people are visiting and how they move through your site. Create more 1-2 step conversions from this data. Keep an eye on that bounce rate. Use your mobile website design to improve it. Paid tools will give you even greater insight like how people interact with videos and mobile apps. To build a seamless mobile website design, you must give people what they want. Data helps us understand how people use their phones and interact with various businesses. People want personalization. They want integration. They want clear calls to action. If you’re local, they want to find you and utilize the local options that you provide them. Learn more about how we can help you optimize your mobile website design to give your customer what they want. Contact us today!